Made of Red Agate, Jasper and tiger eye 6mm beads, leather cord. Made of Red Agate, Tiger Eye Jasper stones (6mm), brown leather, nylon thread, stainless steel button. RED AGATE: stops the burning desires for things we do not need, and assists those juggling commitments or multiple priorities. As a support stone, Agate stabilizes the imagination and inspiration of artists, provides personal security. It provides physical strength and endurance. Agate is also known to help the heart and blood vessels. Wearing an Agate in the middle of the chest strengthens the cardiac muscle, and heals emotional disharmony that prevents acceptance of love. 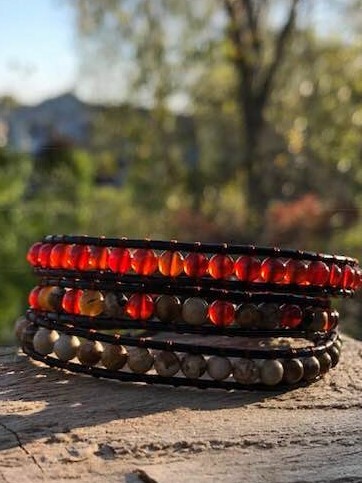 Red being the root chakra, this bracelet will ground your true self and promote emotional growth.